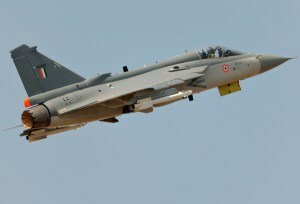 BANGALORE --- Thirty-two years after the project was sanctioned, the first indigenously-built Tejas Light Combat Aircraft (LCA) was today handed over by Defence Minister Manohar Parrikar to the IAF, a red letter day for Indian defence and aerospace sector. The handover signals the start of a process of induction of the fighters, a 4.5th generation aircraft being built at home under a project which has already cost the exchequer nearly Rs 8,000 crore. The entire project by the DRDO and Hindustan Aeronautics Limited is estimated to cost over Rs 30,000 crore. The LCA is significant for its lighter weight and greater agility and manoeuvrability, the statement said. The aircraft that has been handed over has got Initial Operational Clearance-II, which signifies that Tejas is airworthy in different conditions, sources said. The Final Operational Clearance (FOC) is expected by the year-end. This version of the aircraft lacks the latest electronic warfare suite, which was integrated into one of the LCAs two weeks ago, mid-air refuelling and long-range missiles capabilities, among other things that the FOC-configuration aircraft will have. The IOC-I was granted to the aircraft, being built by state-owned Hindustan Aeronautics Limited (HAL), in January 2011. “Defence Minister Manohar Parrikar handed over the first series production Light Combat Aircraft, Tejas made by HAL to the Indian Air Force. The Air Chief Marshal Arup Raha, Chief of the Air Staff received the aircraft documents from the Minister,” a statement by HAL said. “It is a big big day for the country,” a senior DRDO official said. Incidentally, DRDO chief Avinash Chander, whose contract was terminated by the Minister recently with effect from January 31, was not present. Speaking at the ceremony, Defence Minister congratulated HAL and everyone involved in the project and called upon them to think “out of the box” to meet the time-line challenges by applying the right management tools. “Thrust should be given on research and technology by exploiting the existing knowledge base which companies like HAL have,” he said adding that one does not achieve everything over-night. “However by modifying our work culture and by adopting better technology and tools we can achieve the results better”, he added. Raha outlined that LCA is the “need of the hour”, given the operational needs of IAF. HAL chairman R K Tyagi described the handover as one of the major milestones in the history of the Company. He said 60 per cent indigenisation in this LCA project has been achieved so far. Outlining the production plan, he said HAL will produce six aircraft next year (2015-16) and subsequently scale it up to eight and 16 aircraft per year. It is estimated that 20 aircraft will be built by 2017-2018, to make the first squadron of the aircraft. Though the squadron is scheduled to be based in Tamil Nadu, sources said, initially, the planes would be in Bangalore only. The LCA programme was initiated in 1983 to replace the ageing MiG-21s in IAF’s combat fleet but has missed several deadlines due to various reasons. The lighter weight of aicraft is achieved by use of higher percentage of Carbon Fibre Composites. Other significant features of this indigenous aircraft are the Digital Fly-By-Wire System, Flight Control Systems, Open Architecture Computer among others. The Naval variant of LCA is also under development and had last month carried out its first flight from the shore based test facility (STBF) at Goa. In the design and development program, HAL has produced 15 aircraft including the seven in Limited Series Production (LSP), 2 Technology Demonstrators, 3 Fighter Prototype, 2 Trainer Prototype and 1 Naval Prototype. HAL has carried out more than 2,800 sorties under various circumstances including hot and cold temperature armament and weapon deliveries, MultiMode Radar (MMR), Radar Warning Receiver (RWR) and missile firing flight trials. The lighter weight of aircraft is achieved by use of higher percentage of Carbon Fibre Composites. Other significant features of this indigenous aircraft are the Digital Fly-By-Wire System, Flight Control Systems, Open Architecture Computer among others. Tejas has also successfully demonstrated weapon delivery capability during trials at Jamnagar and Jaisalmer, HAL officials said.